We know that natural light is the best light for photography, right? But it’s hard to get that at 9 p.m. I do get it during the day on the weekends though! 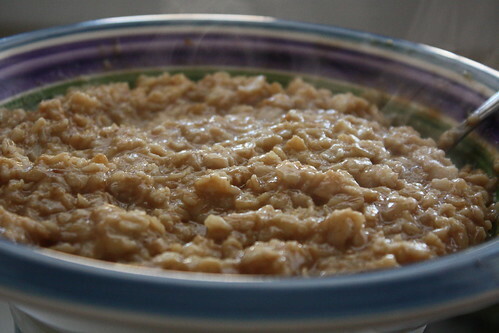 So, I grabbed the camera for the simplest but one of my favorite foods — oatmeal. As you can see on the last image, I put the bowl on top of the oatmeal container to get it up higher near the window in the kitchen. This also allowed for some depth of field play. In the dining room, I hand held the bowl against the window. In both places, I hand held the camera. 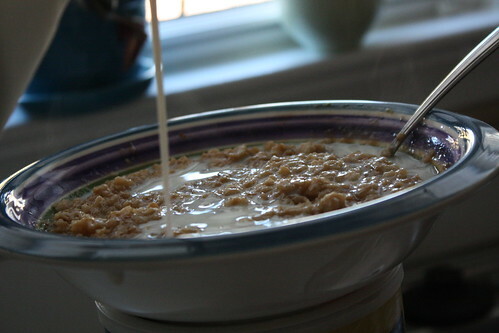 Yes, even when pouring the milk. Yes, I did miss once. No, I didn’t cry. I think I mentioned my crazy course load this semester. Well, I knew it would be time consuming so planned for it. This means very little time for anything else, unfortunately. That means I missed hitting some local markets, planning meals based on sales and sleep. Ok, I did sleep a little. I love this recipe. I’ve been doing it for a few years now with some experimentation with ingredients here and there. All this is cooked for about as long as I want to wait. I guess it takes about 20 minutes to heat everything over medium. 1ish pound of meat (or not). If ground something, it’s browned with the onion and garlic. If it’s leftover something, then I brown the onion first so that I don’t overcook the leftover something. If I’m vegetarian, then I up the bean count by one can. Garlic and onion. I prefer chopped red onion. I add about 2-4 teaspoons of minced garlic. If I’m cooking without meat, then I brown them together in some heated olive oil. 1-2 cans (rinsed and drained) pinto/black/kidney beans. My favorite combination is two beans. I like the difference in look. I believe this time I had one can of pinto and another of kidney. corn for color. I guess I put in about 1-2 cups. If frozen, then I just have to keep that in mind when cooking. Just cook it a little longer. If canned, drained. Rotel diced tomatoes with chile. Usually run about 2 cans of this. I add it with all its juice. It can get a little spicy but I like spicy. 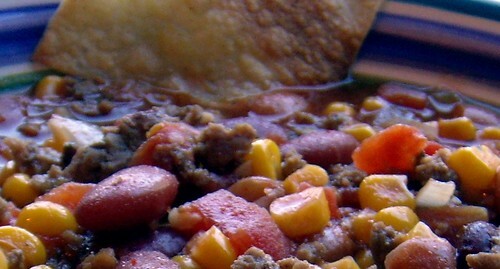 I’ve tried with other diced tomatoes with chile and keep coming back to Rotel. Taco seasoning. I use a packet of low-sodium. I used to have my own taco seasoning mix mixed up but need to get a new jar of it going. Ranch seasoning packet. I only use half of a packet because it’s so salty and stuff. I don’t think it needs a full packet and can save the rest for the next soup. With this, I had some homemade tortilla chips. I quartered some corn tortillas and placed them on a baking sheet. I sprayed them with Pam and put them in a 350 oven for about 13 minutes. They got too brown though so maybe 350 for 9 minutes? Sticky dump chicken: I love the idea of dump chicken but this combination was not good to me. Way too gloppy and the smell as it was cooking was unpleasant. I love peanut butter but this wasn’t what I thought it would be. 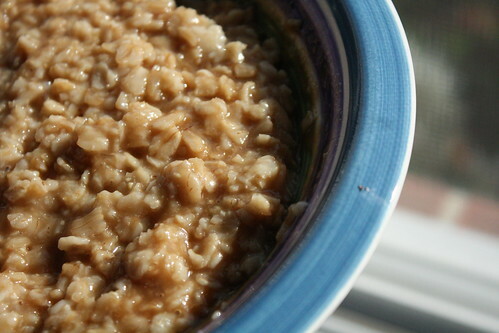 Brown rice: I used instant brown rice in the bag. I thought I’d have sauce from the dump chicken but didn’t 😦 So I added pepper to it and a pat of butter to moisten it. 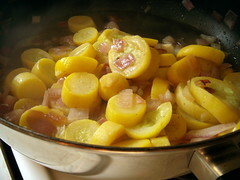 Squash and onion sauté: Again with the random makeups. I had a half bag of frozen squash in the freezer and wanted it. Over medium, I heated extra-virgin olive oil, added leftover chopped up red onion (probably about half an onion), and stirred it around till the onion started to soften. I then added the frozen squash and covered it for about 10 minutes or more. I took the lid off and added pepper and a little salt. With the lid off, the squash lost a little of the squishy look but not too much. Note: Obviously, the chicken isn’t happening again. But overall, the look was bleh. I was hoping for more punch. Ah well. I can really tell when I have natural light in the photos. I held the bowl of soup up against my dining room window to shoot. 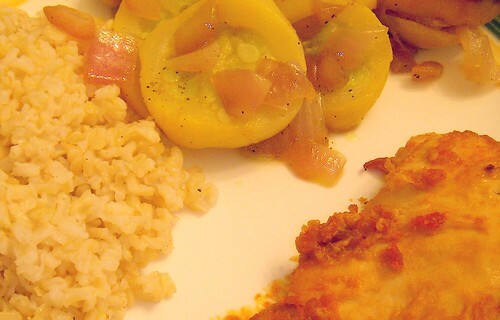 The plate of squash and chicken was photographed on my dining table without outside light. I’ve included a shot of the squash cooking (at right) where there’s some window light coming in.